One thing I struggle with regularly, especially as an INFJ mother, is the tendency to get overstimulated. We INFJs and INTJs live so completely in our heads that outside stimuli, if not pleasant, can be incredibly stressful. 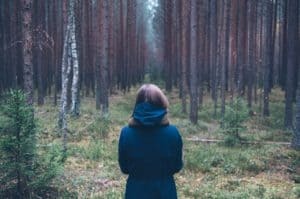 Unlike sensors, who are more focused on the world around them and what’s happening around them, INFJs are often focused internally, where they are constantly thinking of ideas, concepts, strategies, and symbols. For example, while I’m in the shower I tend to think of a lot of ideas and concepts. I’ll often forget if I just shampooed my hair, conditioned it, or if I did, how many times I’ve done it. Sometimes I end up washing my hair three times because I’ve gotten so caught up in my ideas that I’ve completely lost touch with what I was doing. I know this sounds flighty, especially to sensors, but it’s one of the problems with being a dominant Ni (introverted intuition) user. I’m not saying every Ni-dominant type is as much of an airhead in the shower as I am…but this type of thing can be a problem for a lot of us. INFJs and INTJs combine dominant introverted intuition with inferior extraverted sensing. Our Se (extraverted sensing) is very underdeveloped and sensitive, meaning that we consider outside stimuli to be a major distraction from what’s REALLY “important”, which is what’s going on in our heads. Just like ISTPs and INTPs find extreme emotions distracting and kind of disturbing, INFJs and INTJs find external stimuli distracting and (often) disturbing. If we’re in a tranquil atmosphere, a clean house, or if there’s soft music playing, that’s fine. In fact, we REALLY like that. Tranquil surroundings, beautiful places, these are really important to people with inferior Se. Our sensitivity to outside stimuli means that while we’re extremely sensitive in a negative way to unpleasant or loud outside stimuli, we are incredibly affected in a positive way by pleasant outside stimuli. Nardi also says in his book The Neuroscience of Personality, that INTJs and INFJs prefer time away from external stimulation and mundane demands in order to access their rich internal processes. Quiet time alone. It’s what INTJs and INFJs need. I’m a mother of five kids. I completely adore them. My love for them is incredibly strong. I also homeschool them, so they’re pretty much with me all the time (except for my step-son who is with his mother during the school year). With kids there are always interruptions; especially with my toddler, who is in a babbling/screaming/squealing phase. I get migraines probably 4 days out of the week. I get lost in thought and then there’s the “Mom! Mom! Mom!” chant that all mothers are familiar with. I think INFJs and INTJs struggle with this aspect of parenting a little more intensely than other types (although I know all types probably struggle with this). As a dominant Ni-user, I think in puzzle pieces and clues. In my average mental state, I am connecting dots constantly. That’s just how my brain works. When interrupted, all those little puzzle pieces, all those connected dots, scatter everywhere. I’ve lost it. For non-parents, the distraction could be someone at work interrupting them with questions or the ping of a text message on your phone. I’ve found that I almost always have my phone silenced for this reason. A lot of INFJs and INTJs are highly-sensitive people. We don’t like fluorescent lights, loud noises, bright, stimulating environments. My husband likes to laugh at me sometimes because I always want to dim the lights upon entering a room. After I do this I am visibly more relaxed and at ease. He also enjoys action movies, and I do too sometimes, but after a while the explosions and bright saturation of colors, the excess stimuli, gets to be too much for me. I want to bury my head in a pillow and block it all out. I’m not prone to outbursts of anger, but if my kids are being especially loud (as kids are prone to do), I often have to go to my room and take a “time out”. I close the door, lay face-down on my bed for a few moments so that all sensory stimulation is cut off, then I get back up, take a deep breath, and try to keep going with the day. Taking these little breaks is part of what keeps me sane. Introverted intuition is such an intensive, introspective process. 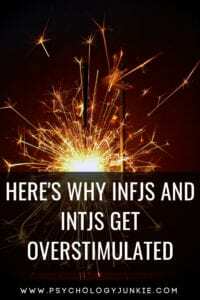 In order for an INFJ or an INTJ to truly be “in the zone” and able to function properly they need to be able to block out all other stimulation and get into a relaxed mental state. Then they can form connections and develop insights. It can take a while to truly get into this “zen state” as Dario Nardi describes it. Often, for me, it happens right around the time I’m trying to go to sleep. You can imagine why! Everything’s dark and quiet and I’m able to completely isolate myself with my thoughts. All the sudden my mind is bursting with insights and revelations that never occurred to me throughout the day. If I get into that relaxed state at home during the day, and then someone turns on some loud music, a TV show, or there are random interruptions or questions, it can be extremely overstimulating. In fact, if my inferior Se is “triggered” (by loud interruptions, over-stimulation, etc,..) I can fall into the grip of extraverted sensing, and become overly indulgent (as Se-inferior types tend to do). This means that in order to “ground” myself in reality, I sometimes will succumb to over-eating, listening to incredibly loud music, or engaging in an unhealthy way in any kind of sensory activity. When I was younger, I used to have issues with cutting when I was overstimulated. Thankfully now this isn’t an issue anymore. Being Ni-dominant doesn’t give me permission to be a huge jerk to everyone in my family when they’re loud or they interrupt my thoughts. This is a season of my life where I’m going to just put a lot of my Ni-traits on hold and focus more on my extraverted feeling and introverted thinking. However, if you have an INFJ or an INTJ in your family you can definitely try to make their life a little easier by giving them some alone time, or not interrupting them when they’re deep in thought. If you ARE a Ni-dominant type then you can try to take little segments out of the day to shut out stimulation and think, even if it’s just for a little while. One of the ways I do this with kids is by packing up my toddler in the stroller and taking him for a walk every single morning. He gets really quiet, and it’s very peaceful, and I can just think. Everyone has different methods and different ways they can achieve this solitude and time to focus. Want to find out more about INFJs? Check out my new eBook here! What do you do to block out sensory stimulation? What kinds of ways do you get into a positive mental state? I’d love to talk to you in the comments! 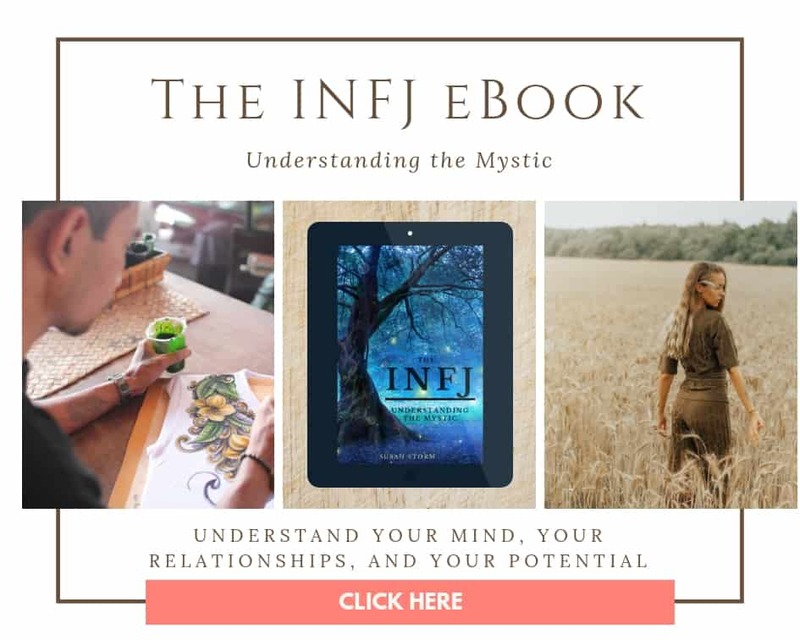 You can also check out more about INFJs in my newest eBook, The INFJ – Understanding the Mystic. This is really me! I get physically ill when the house is noisy. Thank you so much for this article. I’m happy to know that I am not the only one who gets overstimulated. This is such a relief to me. I have always, since a child, had a habit of going to the bathroom and locking the door when feeling overwhelmed, bith at home and at social events. I find the combination of trying to navigate all those other peoples thoughts and emotions too much at times. Sometimes i return from one of my shifts as a mental health nurse and play my music incredibly loud and dance until my body is exhausted, I also sometimes overeat to the point of uncomfortable fullness. I find i cannot relax until my house is tidy and my lights are always kept low. My significant others is a hoarder and he doesn’t understand why his home causes me near physical anguish. Other times i hide under my covers in a dark room for 24-48 hours until I have processed my thoughts and feelings. I have felt so long that these habits were unique to me and faults or oddities. Discovering that these traits are not unusual in INFJs has enabled me to accept myself more. Immediately forgetting if I shampooed or not… What’s worse is my hands have become quantum teleportation gates. The closer something is to being in my hands, the further it is from my person. But I am sought out for creative problem solving. I am happy to know there are others out there since INTJs only make up about 2% and I’m a female so making up even less it is very nice to know there are more out there whom exist and I am not a horrible parent for leaving my boys to do their thing while I sit in my dark bedroom. I believe things are mind over matter however sometimes I feel like a baby and also get ill being over stimulated. Thank you sharing your blog! Oh my goodness. How refreshing it is to read this. I ALWAYS have issues with lights in the room and work hard to establish a really “Zen-like” lighting environment. I never related this to my personality. And yes, I find that people do not understand my need to take a “time-out” after being so seemingly extroverted. I am so glad to find this site and these articles as I feel I am really starting to understand who I am and embrace it fully. Without apology. Hahaha….. I am an male INTJ. I disagreed with the comment about not knowing how many times you have have done something …like washing hair because of deep thought…. that was until I found myself trying to use toothpaste to wash my hands…… thank you.. it made me laugh. I’ve been there too! a few days ago I went to do my post-bath routine, which consists of passing moisturizer to the hair and moisturizer on the face. But then I started to get caught up in thoughts, and by the time I realized I had passed all the rest of the facial moisturizer on my hair. When I saw it was already late, I had to go back impatiently to the shower, wash all the hair again and finally pass the cream right in the hair, haha! On this day I was worried about how crazy it was what I could do when I was running on “autopilot”. I even thought that I would have ADHD or something, because of the mess I was able to do when I was distracted by my thoughts, but now I understand that it is something of INFJ. Curious, I would never have associated this with a psychological type! Read this article it suddenly becomes so clear to me why I (being an INFJ) love the song “Waiting for the Night” by Depeche Mode that much! You should give it a listen. Recently I’ve been having a bit of a struggle in determining if I’m a INTJ, INTP or ISTJ. I know free online tests aren’t reliable but most of the time I get INTJ so that is the one I’m most focused on debunking or proving correct. For me this is quite interesting and makes me think I may actually be one. When I was little I was really sensitive to the light but always thought it was due to having sensitive eyes, though, my biggest clue is that when I’m in crowded places I’m extremely aware of my surroundings, and if there is music that I consider unpleasant (specially at a high volume), I’m at risk of having a panic attack. Nowadays I always carry my earphones wherever I go, so that when I find myself in a situation like that at least I can shut the noise off by listening to music I actually like.